In the laser light show field, a laser controller is a device that sends signals to a laser projector, in order to create shapes such as patterns, drawings, graphics and text. A laser controller would typically be used with a Class 3B or Class 4 laser projector. Operating lasers of these powers carries safety risks and some legal responsibilities. This FAQ answers basic questions information about laser controllers, and about safety implications when used in a home or for commercial purposes. Click on any of the gray rectangle headings on this page, to jump to the answer text. If you are buying from an ILDA Member, they are bound by the Code of Ethics and the Code of Business Practice. If there is a problem, you can file an Ethics Complaint in order to have the Ethics Committee review the issue. They will look at both sides, and will issue a recommendation to help solve the problem. If the ILDA Member does not follow the recommendation, then the Ethics Committee and Board of Directors can take further action up to and including revoking the Membership. Please note that ILDA does not endorse or verify products of any kind, and therefore we cannot speak directly to the compliance, quality or safety of any particular laser controller. A laser controller is a device that sends signals to a laser projector, in order to create shapes such as patterns, drawings, graphics and text for a laser show. The shapes can create dramatic mid-air effects, such as a cone or plane of light. Or the shapes can be projected onto a surface, which is usually done with more complex images such as graphics and text. A laser controller can be “stand-alone” so that it contains all the graphics and controls needed to send signals to a laser projector, in order to make a laser show. Or the laser controller can be in the middle, between a computer that has a control interface, and the laser projector — in this case, the laser controller translates the computer commands into projector-compatible signals. A laser controller can even be built into a laser projector, so that only one “box” is needed to create and project a laser show. 5&6) an additional two projectors creating blue beams at the extreme left and right of the photo. 4) for the blue beams (again, two projectors running off the same signal). ILDA does not make, nor do we test, laser controllers. Being on this list does not necessarily constitute endorsement or promotion. ILDA Members listed are as of December 2016. Laser projectors can vary widely in laser power, color output (single vs. multi-color), and quality of the scanners used to direct the laser beam. ILDA has a page discussing laser projector specifications. If you are new to laser light shows, reading this material will be very helpful. No, because laser light show projectors work completely differently from conventional video projectors. • Laser light show projectors use scanners with tiny mirrors attached, to aim the laser in a pattern under computer control. This is like a connect-the-dots drawing; technically it is a vector image. • Video projectors scan out an image row by row. With each frame, every pixel can be turned on or off. The result is a grid of dots of various colors and brightness; this is a raster image. There are some video projectors which use lasers as their light source. While these have many advantages for displaying video images, the equipment cannot be made to work with a laser light show controller. Some laser light show controllers have a video-like raster scanning mode. They can use vector laser light show projectors to scan horizontal lines quickly, with changing colors, and vertical lines more slowly. This requires high-quality (fast) scanners for best results. The photo shows a 60 pixels-per-line raster, with 60 vertical lines. 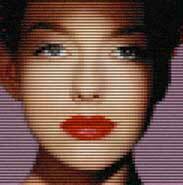 This is low resolution compared even to old Standard Definition TV which is 640 pixels x 480 lines (NTSC). 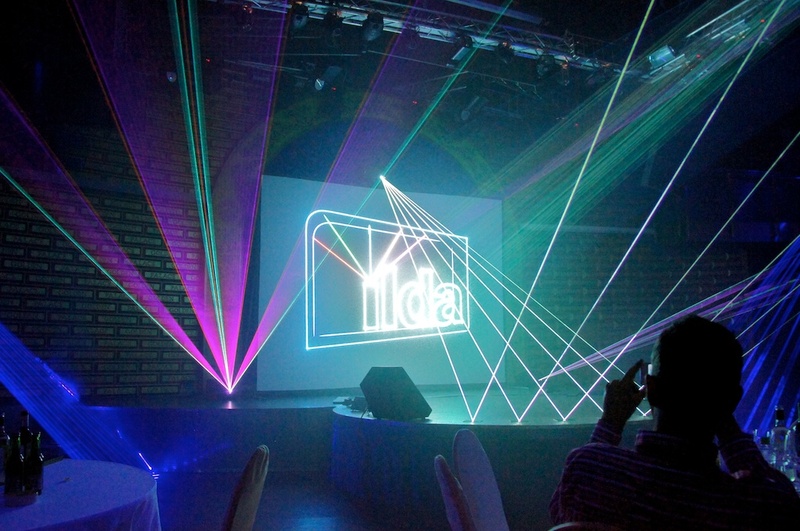 However, most laser light shows consist of beams and/or vector graphics, like those shown in the first photo on the page (ILDA logo plus five beam projectors). ILDA is the International Laser Display Association. We are a worldwide trade association for people and companies that do laser shows, and that make and sell lasershow-related equipment. We do not make, nor do we test, laser equipment such as projectors and controllers. ILDA Members agree to abide by our Code of Ethics, and our Code of Business Practice. If anyone has a problem with an ILDA Member that is a violation of these Codes, they can file an Ethics Complaint. The ILDA Ethics Committee will then attempt to resolve the problem. In addition, we have an annual conference (Dubai in 2015, Baltimore in 2016), an Awards program, safety courses, and other activities. If you are into lasers, we invite you to become a Member. More about ILDA is here at our main website. An ILDA connector has 25 pins. It is the same connector as was commonly used by parallel printers, before USB became common. It is a “DB-25 male” connector on the laser projector, “male” meaning that pins stick out of the connector. A laser controller can connect to this input using a cable with a DB-25 female connector. This cable should be supplied with either the controller or the laser projector. No, the International Laser Display Association does not manufacture laser controllers or projectors. Further, ILDA does not test or certify that laser controllers or projectors actually have a correct ILDA connector. It is up to the manufacturer’s word that they have correctly implemented the 1999 ILDA Standard Projector specification. We have seen systems where the ILDA connector is wired incorrectly. For example, telling the projector to block the laser beam actually turns on the laser; this is an obvious safety hazard. For this reason, you should be careful to buy a controller and a projector from a reputable manufacturer. Laser controllers send signals to a laser projector. A stand-alone controller would not contain a laser and for this reason, stand-alone controllers — not part of a projector — are generally not regulated by government agencies. However, it is possible for a controller to be integrated into a projector, or even to be simply a device that is plugged into a projector. This may then make them subject to government regulation since they could become part of a regulated laser product. The way the controller works could directly impact the safe operation of the laser projector. In the United States, laser projectors, and how those projectors are used (for example, if laser light scans an audience, or goes into airspace outdoors) are regulated by the Food and Drug Administration’s Center for Devices and Radiological Health, and by some state and local agencies. Before your purchase a laser projector, or other equipment to be used with a projector, ILDA recommends ensuring that any laser device is both safe and legal to operate in your jurisdiction. This is especially important when the device is being shipped from another country or region which may have different laws. Yes, under U.S. federal and state laws, if you are doing a laser show in the privacy of your own home, with friends and family, then you are permitted to own and use a laser projector of whatever power you wish. • The beams must be kept out of the sky, or else you may be violating federal and various state laws prohibiting aiming lasers where they might interfere with pilots’ vision. • And of course, you should take great care so that laser beams don’t directly or indirectly (by bouncing off a shiny surface) enter anyone’s eye. You as the laser owner are responsible, legally and morally, for any injuries that may occur. If the laser show is “entered into commerce”, then it is no longer private. Such commercial shows are regulated at the federal level, and in a number of states. According to the U.S. Food and Drug Administration, if a laser show over 5 milliwatts output power is “entered into commerce,” then both the projector and the show itself are regulated by FDA. “Entered into commerce” means that there is some sort of benefit to the laser show producer, or to the persons that the producer works for. The laser show requires admission, or something the show is associated with (a concert or club) requires admission, or the laser show producer is paid in money, goods or services. The FDA has a broad definition of “entered into commerce” so the best advice is: if the laser show is not at your home with family and friends, there is probably some sort of commerce involved, directly or indirectly. If the laser output is under 5 milliwatts — which is very low, the same as a “legal” laser pointer — then there are no special laser show regulations. However, such a show would be very dim and unsatisfactory, except perhaps in a darkened living room. To operate a laser show using a projector over 5 milliwatts — a Class 3B or Class 4 laser product — at the federal level this requires you to have a “variance” from the FDA’s Center for Devices and Radiological Health. You must obtain the variance in advance of getting your laser projector. The laser projector manufacturer should be able to inform you more about this, and to help you with this process (possibly for an extra fee). There is more information at ILDA’s LasershowSafety.info website, and at other websites, about the variance process. At ILDA’s website, check out the U.S. laser laws and regulations page, and the Links and Resources page. In addition, a few states have special requirements. For example, in New York State, you must take a laser operator test and get a license. Arizona, Texas and Florida are three others which immediately come to mind as having special requirements. Too many of these shows were probably done illegally. Either the show producer did not have an FDA variance at all, or the show had a standard variance which does not permit audience scanning. These shows can be shut down and, perhaps more importantly, they have increased liability in case anyone in the audience claims to have an injury. A reputable concert promoter or club owner also will want to ensure that lasers are used safely and legally. The FDA has revoked variances when the safety conditions were not met. When used properly, a laser projector is safe. In 40 years of laser light shows, there have been only a handful of reported eye injuries from laser projectors using “continuous wave” lasers. This page discusses laser light show injuries in more detail. Note the key phrase “when used properly.” What this means is that light from any Class 3B or Class 4 laser (e.g., over 5 milliwatts) must not be aimed into an audience where it can go into people’s eyes, or where it can be intercepted such as putting a shiny object in the beam path. Assuming you do not have an audience scanning variance, U.S. federal law requires laser show beams to be at least 3 meters (~10 feet) above where an audience would be reasonably expected to stand, and at least 2.5 meters (8.2 feet) to the side of the audience area. If you follow this guideline, and monitor the audience to ensure they don’t misbehave in an unsafe manner, your shows will be safe. 1) Keep the beam power reasonable. A total power of under 500 milliwatts should be sufficient for in-home use. This power level is known as Class 3B. Above this is Class 4 which is the most hazardous classification for eye injuries (and for potential skin injuries and material burning). We do not recommend Class 4 lasers for most home or non-professional uses. 2) Keep the beam away from people’s eyes. Consider not only where they are sitting or standing during the show, but if they might stand up or move around. 3) Watch out for shiny, reflective surfaces such as mirrors, glass (if you are aiming through a window), artworks, objects d’art, etc. 5) Do not aim outdoors so that any beams enter the sky. The general rule is that the public cannot aim lasers into the air, where an aircraft is or might be. Since a laser projector usually makes wide patterns that can vary, this increases the chance of missing a tree or house, and going into the air. You can spot an aircraft’s lights up to about 3 miles away … but a 500 milliwatt projector can be a distraction to pilots up to 22 miles away — you would never even see the plane or helicopter. ILDA Members are required to read, understand and acknowledge a document called “Lasershow Safety - Basic Principles”. You can read the document here. Scroll down and click on the big blue button that says “Lasershow Safety - Basic Principles”. Yes, you can take a laser safety course. This is primarily recommended for operators, installers and owners of lasers used in public. ILDA and other companies run such courses; ILDA’s courses are listed here. The page also has a description of the many topics covered in the course. If you wish to take a laser safety course, look for one that concentrates on laser light shows. There are many laser safety courses which cover other uses, such as industrial and medical, but they may touch only briefly on the many topics which are unique to laser light shows.